The amount of information on the current condition of the Cuban economy available as of mid-2003 is very limited in comparison to what had become customary in recent years. Not available at this time are: (1) the official statistical yearbook for 2002 or a preliminary statitistical summary; and (2) the report of the Banco Central de Cuba for 2002. 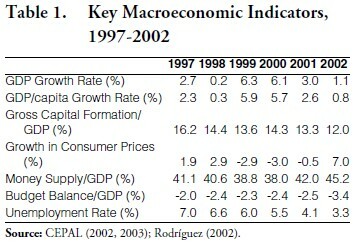 Moreover, the analysis of the performance of the economy for 2002 by the Comisión Económica para América Latina y el Caribe (CEPAL 2003), based on statistics provided by the Cuban government, has more statistical gaps than has been the case in recent years.2 Adding to the dearth of information on the current economic situation is the March 2003 government crackdown on independent journalists that has reduced substantially—although not eliminated altogether— the flow of news and analysis from non-government sources within the island. … 2002 was a year of low growth but high development. Low growth with respect to the gross domestic product, and high development with respect to setting the essential bases for integral human development that transcends the narrow confines of mercantile transactions and goes beyond the conceptions of development that exist in the neoliberal, globalized world, affected by a deep economic crisis and even more affected by a crisis in human values (Martínez 2002). This view was echoed by Minister of the Economy and Planning José Luis Rodríguez, who in his endof- the-year address to the ANPP recalled that: In more than one occasion, compañero Fidel has referred to the deficiencies of the GDP as a measure of the economic development of a nation. …. The entirely justified criticisms [of the concept of GDP] made by compañero Fidel are more poignant in the case of Cuba because this international methodology, in addition the deficiencies of GDP itself, underestimates our performance in relation to other countries given the higher percentage of free and subsidized services in Cuba as well as that measure’s inability to capture properly the moral values created by a society like ours … (Rodríguez 2002). Notwithstanding the effort to deflect the attention from the anemic economic performance by criticizing the measure, it is evident that the economy stagnated in 2002. The prospects for 2003 are equally gloomy. Beginning with 2001, Cuba rebased its national accounts statistics to 1997 (1981 had been used as the base year for nearly two decades). In addition to changing the price base and presumably rebalancing components of GDP to reflect their relative importance in 1997, the revision also included other changes: (1) introducing measures of activity in the banking and insurance sector; (2) changing the methodology for imputing rents for privately-owned dwellings; (3) incorporating additional data from the tourism sector; and (4) expanding coverage of production by self-employed workers and by households (ONE 2002, pp. 85-86). As a result of the rebasing and of other methodological changes, a long-term GDP series is not available (the Official Statistical Office has only recalculated GDP on the new basis back to 1996). Thus, it is no longer possible to compare recent GDP levels to those of earlier periods, e.g., to 1989 and earlier, to assess the extent to which current Cuban GDP levels compare with those before the economic crisis of the 1990s. Compounding the problem in making comparisons over time is the fact that levels of GDP in the new series are significantly different—roughly 60 percent higher—than those for the earlier series.3 Annual growth rates are also somewhat different between the two series, although for the four years (1997-2000) for which growth rates are available based on both series, the cumulative growth rates are very close (16.1 percent for the 1997 series v. 16.3 for the 1981 series). As discussed above, GDP in 2002 reportedly rose by 1.1 percent (and GDP per capita by 0.8 percent), the third consecutive year of declining GDP growth rates, suggesting a stagnant economy (Table 1). Cuban officials (Martínez 2002) blamed the weak economic performance in 2002 on external economic shocks and adverse climatic conditions: the slowdown in world tourism after the September 11 terrorist attacks, adverse terms of trade for oil and sugar, the world economic slowdown and U.S. economic sanctions, as well as three hurricanes (Michelle in November 2001 and Isidore and Lili in 2002).4 This assessment is echoed by CEPAL (2002, p. 94), stating that the growth slowdown was attributable to “external and climatic mishaps (adversidades).” Cuban officials and CEPAL thus hold harmless wrongheaded Cuban economic policies and lack of policy reforms, contrary to the views of other analysts within and outside the island who have posited that external factors did not cause the slowdown of the economy of 2001-2002 but instead aggravated an already existing problem: the malaise of the domestic economy (Mesa-Lago 2003, p. 23). Gross capital formation (investment) declined by 9.2 percent in 2002. The ratio of investment to GDP was 12.0 percent in 2002, down from 14.3 percent in 2001. This ratio was much lower than in the 1980s, when it was in the range of 25 percent. Investment in 2002 was concentrated in the following sectors: oil and gas production, electricity generation, tourism, priority social programs and housing. In the mid-1990s, the Cuban government was successful in stabilizing the economy, bringing down inflation and a mushrooming government budget deficit. In 2002, however, macroeconomic instability seemed to be reappearing. After several years of price stability (actually, deflation in 1999-2001), consumer prices rose by 7 percent in that year. At the end of 2002, the money supply was estimated at approximately 45 percent of GDP, up from 42 percent a year earlier. The budget deficit in 2002 reached 3.4 percent of GDP, compared to 2.5 percent a year earlier and 2.4 percent for several previous years. Minister of Finance and Planning Millares (2002) attributed the deficit to extraordinary expenses associated with hurricanes Isidore and Lili as well as substantial increases in budgeted expenditures on education, public health, pensions, culture, arts, sports, and science and technology. Despite the adverse economic conditions, unemployment reportedly fell in 2002 to 3.3 percent from 4.2 percent a year earlier. Three observations regarding this very low, and declining, unemployment rate are in order: (1) the reported unemployment rate refers to open unemployment and therefore masks the severe underemployment that exists in the island. CEPAL estimated measures of “equivalent unemployment”— open unemployment plus underemployment— for the mid-1990s in the range of one third of the labor force (the open unemployment at that time was in the 7-8 percent range); (2) not counted as unemployed in 2002 are the roughly 320,000 persons engaged in “urban agriculture,” tending to garden plots located within and in the outskirts of cities and the nearly 120,000 high school drop out youths who have been enrolled in the “schooling as a job” program; and (3) also out of the labor force are over 7,000 youths that have been tapped to be trained as social workers. Sugar: Sugar production increased by 2 percent in 2002 over 2001, from 3.530 million tons to 3.605 million tons (Table 2). Production in 2002 was about 9 percent below the average 3.970 million tons produced in 1996-2000 and 56 percent below the 8.121 million tons produced in 1989. During the 2001-2002 sugar zafra, which ended in June 2002, 104 sugar mills were in operation and 52 were idle (Varela Pérez 2002). Oil: Oil production, a sector that has attracted a great deal of foreign investment, continues to be a star performer. In 2002, oil and gas production reached the historical high of 4.1 million tons of oil equivalent, a 20 percent increase over the 3.4 million tons produced in 2001 (“Rompen petroleros” 2002).5 Oil production rose by 26 percent to 3.5 million tons, while natural gas production fell from 595 to about 585 million cubic meters. According to Minister Rodríguez, 74 percent of the electricity produced in 2002 was generated using domestic crude. Cuba has invested about 1 billion pesos to modernize and reconvert thermoelectric plants to use domestic crude. Plans are for up to 90 percent of electricity to be generated from domestic crude. Nickel: Nickel production in 2002 was basically unchanged from 2001, at about 75,600 metric tons. Foreign-invested Nicaro Nickel again set a new historical production record (Rodríguez 2002). Production in 2002 exceeded nominal production capacity, suggesting that additional increases in production are not feasible without an increase in investment. Non-sugar Agriculture: In the non-sugar agricultural sector, particularly severe were a 50 percent decline in citrus and a 27 percent decline in plantain output in 2002. Both of these crops were damaged by high winds associated with the hurricanes that affected the island in 2001 and 2002. Output of tobacco and corn were essentially unchanged in 2002 compared to 2001, while output of viandas (excluding plantains) reportedly rose by 5 percent. Also rising, by an unspecified amount, was production of vegetables (hortalizas). According to Minister Rodríguez (2002), production of animal feed “stabilized” in 2002, so that Ministry of Agriculture production of pork increased by 27 percent and of eggs by 16 percent. These production increases refer only to production by the state sector and therefore do not reflect output growth at the national level. Minister Rodríguez (2002) admitted that food production was still not sufficient to meet national needs. Daily food consumption in 2002 was estimated at 2,916 calories and 76.8 grams of protein per capita, roughly the same levels of 1989. Tourism: After several years of double-digit growth, the Cuban tourism sector slumped in 2001 as a result of world economic slowdown compounded by the aftermath of the terrorist attacks of September 11. In 2001, the number of tourist arrivals barely surpassed arrivals in 2000 (1.775 million tourist arrivals in 2001 compared to 1.774 million in 2000) and revenue from tourism fell by 108 million dollars or 5.5 percent (Table 3). In mid-2002, Tourism Minister Ferradaz stated that tourist arrivals in the first quarter of 2002 were 14 percent below the previous year. To stimulate travel by Europeans, Cuba authorized the use of euro in all international tourism facilities (since June 2001, use of the euro had been authorized in Varadero); more than 55 percent of tourists traveling to Cuba originated from Europe (“Ministro admite” 2002). The World Tourism Organization, in an early report of the performance of the industry in 2002, reported that Cuban tourist arrivals were off by 6.7 percent from a year earlier (“World Tourism” 2003). A subsequent report by the same organization indicated that tourist arrivals in 2002 were 1.686 million, 5 percent under 2001 (“Short-Term” 2003). The figure in this latter report matches up with the tourist arrivals figure reported by CEPAL (2003) and with the 5 percent decline in the tourism sector that Minister Rodriguez (2002) reported for 2002. Gross tourism revenue in 2002 has been reported at $1,769 million, 3.9 percent below the level in 2001. Revenue per tourist-day fell by 1.8 percent in 2002, to $150.7, the fourth consecutive year of decline in this important indicator (Table 3). Despite the slump, construction of the tourism infrastructure continued to grow in 2002, with the number of hotel rooms suitable for international tourism reaching 40,000 at the close of the year. The occupancy rate in 2002 was 57 percent, compared to 58 percent a year earlier (Table 3). The share of domestically- produced goods and services within the inputs of the tourism sector repeatedly reached 68 percent in 2002 (Rodríguez 2002). The condition of the external sector continued to be critical in 2002. Exports of goods and services were down from 2001 and consequently imports of goods and services had to be severely restrained. Foreign investment recovered from 2001 and remittances continued to play a critical role in providing resources in convertible currency. The foreign debt in convertible currency rose slightly and Cuba again faced difficulties in meeting foreign debt servicing obligations and sought further concessions from key creditors. The unofficial dollar-peso rate of exchange remained at 26 pesos to the dollar. Table 4 brings together estimates of key indicators of the performance of the external sector culled from several sources. Meanwhile, based on official statistics, CEPAL (2002) has estimated that exports of goods and services in 2002 amounted to 4.3 billion pesos, down by 6.5 percent from the 4.6 billion recorded in 2001. Two factors contributed importantly to the fall in the value of exports of goods and services in 2002: (1) the reduction in the number of tourists and in revenues from tourism; and (2) weak international market prices for sugar, which were about 20 percent below the average price in 2001.7 As shown in Table 5, the top 5 merchandise export markets for Cuba in 2001 were Russia (Russia continues to be the main importer of Cuban sugar), three members of the European Union and China. As discussed above, Europe is also the source of most tourists, thereby highlighting the importance of relations with Europe for the Cuban economy. Imports of goods and services fell sharply in 2002, to under 4.8 billion pesos from 5.5 billion pesos in 2001 (CEPAL 2003) or by 14 percent. The oil bill in 2002 exceeded $1 billion (Rodríguez 2002), as oil world market prices rose during the year from about $20 to $26 per barrel (World Bank 2003) and supplies from Venezuela—under a bilateral arrangement—suffered disruptions. Despite increases in domestic oil production, imports still accounted for 55-60 percent of Cuba’s oil consumption.8 As is clear from Table 5, Venezuela was Cuba’s top source of merchandise imports in 2001 and most likely continued to hold this position in 2002 by virtue of its position as main provider of Cuba’s oil imports. Spain, Canada and China, three of Cuba’s top-five markets for exports, were also among the top-five Cuban suppliers in 2001. In 2002, Cuba imported about $255 million worth of products from the United States, primarily agricultural commodities (Jordan 2003). Pursuant to the terms under which these transactions were authorized by the United States,9 Cuba had to pay in cash for them and such purchases therefore represented a serious drain on foreign exchange holdings. Purchasing from the United States on a cash basis in an environment of foreign exchange shortages and when credits for agricultural imports are available from other countries does not make sense unless the motive for the transactions is to whet the appetite of U.S. agricultural exporters to enlist their support in modifying the U.S. trade embargo. As with trade in goods and services, there are no official statistics on the balance of payments for 2002. CEPAL (2003) has estimated some of the main components of the balance of payments; these are reported in Table 6 together with official balance of payments statistics for 1996-2001. According to CEPAL, the deficit in trade of goods and services reached 513 million pesos in 2002, much lower than in previous years. Factor payments were estimated at 600 million pesos. These outflows were compensated, to a large extent, by current transfers (mostly personal remittances), estimated at 820 million pesos in 2002. Based on a survey of remittances senders and other sources, the Inter-American Development Bank (IDB 2003) has estimated that remittances to Cuba amounted to $1.138 billion in 2002, 22 percent higher than the roughly $890 million the same source estimated was remitted in 2001. If these latter estimates turn out to be correct, they would mean that remittances to relatives and friends in Cuba played even a larger role in addressing the serious foreign exchange shortages in the island. According to the CEPAL estimates, the deficit in the current account of the balance of payments in 2002 was roughly 293 million pesos. CEPAL estimates that capital flows into the island during 2002 amounted only to 300 million pesos, for a positive change in reserves of 7 million pesos. There is very little information on the composition of capital flows in 2002. However, Cuban economist Triana Cordoví (2003, p. 10) has reported that foreign direct investment in 2002 reached $100 million and 24 new joint ventures were established, a significant increase from the $34 million in foreign direct investment in 2001 (according to official data in Table 5, foreign direct investment in 2001 was nearly $39 million). As reported in Table 4, Cuba’s debt in convertible currency rose slightly in 2002, to 10.9 billion dollars. There is no detailed information on Cuba’s creditors in the latter year, but in 2001 more than 19 percent of the debt was with Japan and about 15 percent with Germany.10 CEPAL (2003) estimates that 32.4 percent of the debt consisted of export credits backed by government guarantees, 26.0 percent were bank loans and deposits, and 17.0 percent were government- to-government loans. Cuba has been in technical default of its foreign debt since the early 1980s and therefore its borrowing has been limited to supplier credits and short-term loans with very high interest rates. As of mid-2002, Cuba’s main short-term creditors were France ($548 million), Netherlands ($302 million), Spain ($300 million), Germany ($140 million) and Italy ($105 million) (Triana Cordoví 2003, p. 9). China reportedly committed $400 million in long-term loans to Cuba in April 2001 (“Cuba’s Foreign Debt” 2002). • In October 2002, Cuba defaulted on a $750 million refinancing agreement with Japan’s private sector pursuant to a refinancing agreement signed in 1998 (“Cuba’s Economy” 2003). • Mexico is seeking repayment of approximately $400 million owed by the Cuban government to the Banco Nacional de Comercio Exterior (Bancomext); the loan dates to the early 1990s and was restructured recently at Cuba’s request (“México quiere” 2003). Cuba reportedly missed a payment in June 2002 (“Cuba’s Economy” 2003). • Cuba is in arrears on $100 million short-term credit lines from Panamanian banks and trading companies (“Cuba’s Economy” 2003). • France’s export financing agency, COFACE, has suspended Cuba’s $175 million credit line because of Cuba’s failure to make repayments; this line of credit was used in the past to finance French exports to Cuba of agricultural products and capital goods (“Cuba’s Economy” 2003). • In 2003, Cuba had the worst repayment record within Spain’s creditors. Cuba accounts for nearly one-third (32.5 percent) of Spain’s overdue debts from sovereign nations (“Cuba es el primer” 2003). • As of February 2003, Cuba owed Venezuela $266 million pursuant to the Integral Cooperation Program between the two countries signed in 2000. Cuba imports Venezuelan oil under the agreement. The debt includes $127 million already in arrears (Ventura Nicolas 2003). Cuba’s high water mark with respect to economic policy experimentation and reform was the early 1990s, when several initiatives that promoted a modicum of economic liberalization were put in place. Since the financial sector reform of 1997, no new policy initiatives of significance have been implemented and, in fact, the Cuban government has deliberately eroded the impact of some of the earlier reforms through bureaucratic means and gone back on others to reestablish state control over the economy. An announcement by the Cuban Central Bank in July 2003 that thenceforth state enterprises would be prohibited from making transactions among themselves in U.S. dollars and would have to change any U.S. dollar balances they held into “convertible pesos,” was seen by analysts as a way to reverse a key measure reluctantly taken in the early 1990s—the legalization of the use of the U.S. dollar—and might signal a return to centralized direction of the economy (“Cuba starts” 2003; Frank 2003a). Some analysts anticipated that the VI Congress of the Cuban Communist Party, scheduled for October 2002,11 would generate some economic liberalization steps that might revitalize the economy. However, as of mid-2003, the VI Party Congress has not been held and no firm convocation date has been announced. In a subtle criticism of the lack of reforms, Cuban economist Triana Cordoví (2003) asked rhetorically whether the means (resortes) that had brought about economic growth since the mid-1990s (he mentions increases in tourism and oil production, creation of an internal market based on foreign currency, attraction of foreign investment and mobilization of domestic savings associated with financial sector reform) had been exhausted and wondered if new approaches were needed to revitalize the economy. Since the mid-1990s, then, the policy of the Cuban government has been to make no additional economic liberalization concessions and stay the course of orthodox socialism. The recent economic initiatives— e.g., urban agriculture and the restructuring of the sugar industry (see below)—fit this mold of paralysis of economic reforms. Changes in the economic leadership suggest a hardening of the line against further reforms. The National Urban Agriculture Program started in 1994 as a response to the dire need for food and the lack of transportation and housing necessary to redeploy urban unemployed workers to the countryside to work in agricultural activities (75 percent of the Cuban population resides in urban areas). Since then the program has grown by leaps and bounds and become an important producer of food. At the end of 2002, organized urban agriculturalists controlled about 35,800 hectares of land growing fresh vegetables and herbs in over 4,000 organoponics (raised beds filled with organic matter), 8,600 intensive vegetable gardens, 180,000 small plots and 300,000 backyard plots, the latter coordinated through the local Committees to Defend the Revolution (CDR) (Madruga 2003; Companioni and Ojeda Hernández 2002). Output from the National Urban Agriculture Program in 2002 was estimated at 3.1 million tons of fresh vegetables, and urban agriculture employed 320,000 workers throughout the island (Rodríguez 2002). • 71 mills would be permanently shut down. Seven of these mills would be converted into tourism facilities and the remaining 64 would be demolished and their equipment used as spare parts for other mills. Although there are no precise statistics on the number of workers affected by the restructuring plan, analysts estimated that approximately 100,000 workers—roughly evenly split between field and mill workers—would be affected. General Rosales del Toro, Sugar Industry Minister, stated in 2002 that the restructuring plan was intended to maintain an industry capable of producing about 4 million tons of sugar per annum, roughly the average production volume during the special period, but with higher efficiency, lower costs, higher profitability, and making a greater contribution to the national economy (Varela Pérez 2002b). • In October 2002, Construction Minister Juan Mario Junco del Pino was dismissed from his post and replaced by then Vice Minister Fidel Fernando Figueroa de la Paz. Normally, no explanation about personnel changes is provided, but in the case of Junco del Pino, the Cuban media stated that “this decision responds to the fact that the organization failed to meet the anticipated results under his direction, and to the need for this sector—notwithstanding being affected the material restrictions facing the nation—to reach higher quantitative and qualitative results under more demanding management and higher levels of discipline, organization and control” (“Castro destituye” 2002). • Minister of the Economy and Planning José Luis Rodríguez was dropped from the Council of State in March 2003, and replaced in this key policy-making body by Francisco Soberón, President of the Cuban Central Bank (“El gobierno mantiene” 2003). Earlier in the year, 4 of the 6 vice ministers responding directly to Minister Rodríguez were dismissed (“La Habana sustituye” 2003). As of mid-2003, Rodríguez remained at the helm of the Ministry of the Economy and Planning, however. • Minister of Transportation Alvaro Pérez Morales was dismissed in mid-June and replaced by Manuel Pozo Torrado (“Destituyen” 2003; Batista 2003). • At about the same time, Minister of Finance and Prices Manuel Millares, who held the post since 1995, suffered the same fate and was replaced by Georgina Barreiro (“Cae el titular” 2003; “Designan nuevo” 2003; Batista 2003). Although the new appointees are younger than their predecessors, there is no reason to expect that their appointment signals new policy directions. In fact, the new appointees are viewed as being loyal to President Castro and perhaps less open to reform than their predecessors. One analyst described the new appointees as follows: “They’re baby dinosaurs. Their thinking is old guard, but they just happen to be younger” (San Martin 2003). • construction of about 2,000 additional rooms for tourists and increase in the number of tourists as large as possible given conditions in the international market. • The 2003 budget anticipated a deficit of 1.074 billion pesos, about 3.4 percent of GDP (Millares 2002). As of mid-2003, some information was available on the performance of the sugar and tourism sectors. • According to unofficial sources, sugar production in the 2002-2003 zafra was in the range of 1.9 to 2.0 million tons (Frank 2003b). (Sugar production of 2 million tons would mean a 45 percent decrease from 2002 and the lowest production volume since 1912.12) The 2002-2003 zafra lasted 180 days and 71 sugar mills operated producing sugar, with 14 others producing molasses (Carralero Hernández 2003). A Sugar Ministry official attributed the dismal results of the 2002-2003 harvest to three factors: (1) lack of financing; (2) management problems, including failing to react adequately to the changes brought about by restructuring; and (3) excess rainfall. Cuban officials are banking on the rebound of the industry in the 2003-2004 sugar harvest, dubbed la zafra de la restructuración (Martori 2003). • Tourism Minister Ferradaz reported that tourist arrivals in the first half of 2003 were 16 percent ahead of 2002, suggesting that the total for the year would approximate 1.9 million tourists (“Aumentarán” 2003).13 This assessment is consistent with information from the World Tourism Organization indicating that tourist arrivals for the first four months of 2003 were 19 percent higher than in 2002 (“Short-Term” 2003). Optimism about the recovery of the Cuban tourism industry is also evident in Spanish firm Sol Meliá’s decision to continue with its expansion program in the island, including three hotels under construction (“Sol Meliá” 2003). The condition of the Cuban economy in 2002-2003 can be characterized by: (1) stagnation; (2) foreign exchange crisis; and (3) policy paralysis. Taking into consideration that the shortage of foreign exchange will increase in 2003, the implementation of measures that would deepen the institutional and structural reforms that began in the 1990s—such as the gradual elimination of exchange rate and price system duality, the consolidation of macroeconomic adjustment, the liberalization of self-employment and the resumption of foreign investment in the real estate sector—will be delayed. Writing in the spring of 2002, Peters (2002, p. 10) was pessimistic about the prospects for further economic reforms: “Based on the current economic policy discussions in Cuba, it seems highly unlikely that a new round of economic reforms would be adopted in the near term. It therefore seems very likely that the partially met challenges of Cuba’s unique brand of socialism will be faced by the island’s next generation of economic policy makers.” A year later, Peters’ pessimism about further reforms seems still valid, although the economic environment—particularly with regard to the external sector—is less auspicious than what Cuba faced in 2002. 1. This paper expresses strictly the personal views of the author. 2. CEPAL also produces a very brief preliminary analysis of the performance of each economy in the Latin American and Caribbean region typically released in December as part of a larger CEPAL publication. The December 2002 publication has a section on Cuba. See CEPAL (2002). 3. See Espinosa Chepe (2003a) for some puzzles in the rebased statistical series. 4. According to CEPAL (2002, pp. 94-95), hurricane Michelle inflicted damages estimated at 1.9 million pesos (6.3 percent of GDP), while the damage inflicted by Isidore and Lili has been estimated at 800 million pesos (2.7 percent of GDP). Minister Rodríguez (2002) has stated that hurricane Michelle damaged about 180,000 dwellings, destroying over 18,000, and affected electricity, transportation and telecommunications infrastructure, crops and industrial facilities; meanwhile, hurricanes Isidore and Lili damaged over 92,000 dwellings and destroyed over 17,000, and affected roads, electricity and telecommunications infrastructure and tobacco and citrus plantations. 5. In a feat of accurate forecasting, in early August 2002, Cuban officials were already predicting that production of oil and gas would reach 4.1 million tons and represent an increase of 20 percent over 2001 (Oramas 2002). 6. CEPAL (2003) reports slightly different merchandise export and import figures: 1,436 million pesos for exports and 4,160 million pesos for imports. 7. The average world market price for sugar in 2002 (International Sugar Agreement, ISA, daily price, raw, f.o.b. and stowed at greater Caribbean ports) was 6.9 cents/pound, compared to 8.6 cents/pound in 2001. See World Bank (2003). 8. The lower foreign oil dependency ratio is from Oramas (2002) and the higher from CEPAL (2003). 9. The legislation that authorizes certain U.S. exports to Cuba is the Trade Sanctions Reform and Export Enhancement Act (TSRA) of 2002. 10. According to the Banco Central de Cuba (2002), 33.9 percent of Cuba’s debt in 2001 was denominated in U.S. dollars; 19.2 percent in Japanese yen; 14.7 percent in German deutsche marks; 9.4 percent in Eurodollars; 6.4 percent in Swiss francs; 4.4 percent in Canadian dollars; 3.5 percent in British pounds; 3.0 percent in Spanish pesetas, 1.3 percent in French francs; and 4.2 percent in other currencies. 11. Following the practice of the communist countries, Cuba held major Congresses of its communist party at five-year intervals beginning in 1975. These party congresses typically evaluated developments during the previous five-year period and set out policy guidance and goals for the next. The most recent such congress, the V Congress of the Cuban Communist Party, was held in October 1997 and the VI Congress was expected in October 2002. 12. Cuba first produced over 2 million tons of sugar in 1912. At the time, demand for Cuban sugar was stimulated by the disruption to the European sugar beet industry associated with World War I and the Cuban industry expanded eastward to the provinces of Camagüey and Oriente. Production remained above the 2 million-ton mark for the next 90 years. 13. The Cuban press (Comellas 2003) reported the arrival of the one-millionth tourist of the year 2003 on June 29, one month earlier than in 2002. This is consistent with the 16 percent growth rate in tourist arrivals reported by Minister Ferradaz for the first half of 2003.